What is the context of the quote “With great power comes great responsibility”? Without a doubt, this is one of the most famous quotes from Spiderman. I think that in the movie, it's Uncle Ben who says it. However, was the quote also present in the comics? More importantly, what was the context of the quote, since AFAIK Uncle Ben and Peter Parker were not in positions of power at the time? I can't find the comic number itself, but here is the only instance of it that I know of in the actual comics. It was not said to Peter by anyone, just a caption box. The often-quoted Spider-Man theme of "with great power comes great responsibility" is widely attributed to Uncle Ben. However, this was not initially true. In Amazing Fantasy No.15, the original version of the phrase appears in a narrative caption in the comic's last panel, not as spoken dialogue. In fact, Ben has only two lines in the entire comic. However, later stories and flashbacks that took place when Ben was still alive retroactively made the phrase one of Ben's many homilies he would lecture Peter with. Latter-day reinterpretations of Spider-Man, such as the Spider-Man movie and the Ultimate Spider-Man comic, depict Ben as saying this phrase to Peter while he is still alive, in their last conversation. Both the aforementioned adaptations also had Peter lash out at Ben just after he says it, and both also mention his father. Also, in Marvel: Ultimate Alliance, when the player speaks with Spider-Man, they attempt to say the phrase to him, only for him to interrupt them. We can attribute the earliest usage of this phrase to Voltaire, albeit in French. New York City Mayor-Elect Thomas Francis Gilroy used the phrase "With great power comes great responsibility" in an 1892 interview with The New York Times. It's used in several contexts. In the saturday morning cartoons, it was a common voice over and editorial comment by Stan Lee, and also in internal monologues by Peter Parker. 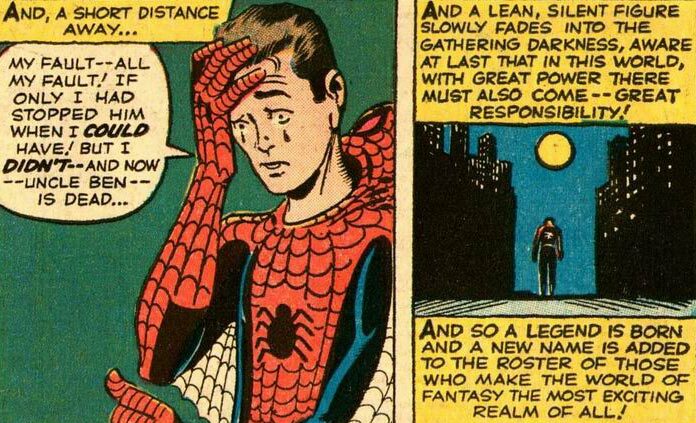 In Amazing Fantasy #15, it's also a narrative context. It's attributed in later canon to Uncle Ben, both shown as Ben speaking it to Peter in the car, and also Peter in narrator mode (especially in the cartoons) mentioning it in internal monologue, usually in the form of, "As Uncle Ben said, 'With great power comes great responsibility.'" It has also been used on occasion by other characters; I don't remember exactly where, but ISTR Professor X has used it as an occasional admonition to students at the Xavier School. Not the answer you're looking for? Browse other questions tagged comics spider-man quotes marvel or ask your own question. In The Amazing Spider-Man, is there an in-universe explanation why nobody would try to trace Spider-Man via his purchase of Oscorp Biocable? Is there an alternate timeline where Uncle Ben survives and Aunt May doesn't die? How is Spider-Man's identity a mystery when Peter is seen performing unusual feats? Does the Batmobile have a music player?